Stocks ended mixed during trading on Wednesday, November 29, 2017. Overall, the Dow Jones climbed 0.44%, S&P 500 skid 0.04%, and Nasdaq dove 1.27%. Commodities saw steep losses across the board: crude oil declined 1.03%, gold dropped 0.93%, and silver dove 2.21%. Micro-caps declined on Wednesday, as eight of the ten indices saw losses today. 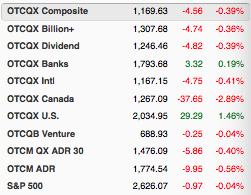 Leading the declines was the OTCQX Canada Index, which sank 2.89%. On the other hand, the OTCQX U.S. Index was the top performer on Wednesday, after surging 1.46% today. MobiCard, Inc. (OTC Pink: PTOP) +993.75%: Shares of the mobile business platform skyrocketed 993.75% on Wednesday, after the company released details on its new cryptocurrency, MobiCoin. AppSwarm, Inc. (OTC Pink: SWRM) +377.78%: The mobile app developer shot up 377.78% on Wednesday, November 29, 2017. In addition, the stock was featured in one of our early articles this morning; read about it here. Lico Energy Metals, Inc. (OTCQB: WCTXF) +51.18%: Shares of the lithium and cobalt mining company surged 51.18% on Wednesday, November 29, 2017. In addition, the stock was featured in one of our early articles this morning; read about it here. Envoy Group Corp. (OTC Pink: ENVV) +37.25%: The cryptocurrency company jumped 37.25% today, but there was no recent news or press from the company. Overall, the stock saw volume of 5.23 million shares on the day. Singlepoint, Inc. (OTC Pink: SING) +24%: Shares of the cannabis and cryptocurrency company climbed 24% on Wednesday, after the company announces a strategic partnership with AppSwarm, Inc. (OTC Pink: SWRM). Getswift, Ltd. (OTC Pink: GSWTF) +20.75%: The Australian-based company rallied 20.75% on Wednesday, but there was no official news or press that could be found. Overall, the stock saw volume of 406,795 shares on the day. Future Farm Technologies, Inc. (OTCQB: FFRMF) +17.24%: Shares of the cannabis technology company gained 17.24% today, after announcing it has closed on its 120-acre licensed industrial hemp farm acquisition. GrowGeneration Corp. (OTCQX: GRWG) +11.90%: The hydroponics retailer increased 11.90% on Wednesday, but there was no official news or press that could be found. Overall, the stock saw volume of 338,418 shares on the day. Namaste Technologies, Inc. (OTCQB: NXTTF) -24.87%: Shares of the cannabis company dove 24.87% on Wednesday, after recently announcing it will divest all non-cannabis assets. Cannabis Science, Inc. (OTC Pink: CBIS) -15.14%: The cannabis company dropped 15.14% today, but there was no official news or press from the company. Overall, the stock saw volume of 51.83 million shares on the day. Aurora Cannabis, Inc. (OTCQX: ACBFF) -13.93%: Shares of the Canadian cannabis giant declined 13.93% today, after announcing it has completed its $115 million financing deal. Glance Technologies, Inc. (OTCQB: GLNNF) -11.45%: The mobile payments company closed down 11.45% on Wednesday, after announcing an increase of its bought deal financing to $11 million. Check back on EmergingGrowth.com after the markets close each day to get your Daily Dozen closing report!